I originally posted this in the technical area but got no responses so I'm gonna try here.Hello my sea fairing friends!So I have a couple questions, 2012 175 w/ 3.0L TKS carb'd merc alpha 1 gen 2How do I get my ign it base timing? I know it has something to do with disconnecting a connector on the distributor and/or jumping certain wires, also something to do with the shift interuptor switch. But the info I've found isn't all that discriptive. There is a pic below of my distributor and I'm all but certain the connector with the 2 purple wires and the 1 white w/black wire is the one I'm after.Also, (at base timing) 2 deg BTDC @ 800 RPM engine warm is what I want it set to right?Lastly, I ask because I'm winterizing and spraying some storage fogger oil into the cyl's through the spark plug holes, after I spray I wanna crank the engine a few revolutions to spread the oil around with the plugs out. Of coarse the ign coil will be damaged if I don't have the plugs or plug wires grounded while cranking. If I turn the dead man switch/kill switch to off and crank the engine in neutrel I will not have spark and effectivly deactivate the ign and coil, there by saving my coil from damage, correct? My .02 IF you are going to fog the cylinders through the plug holes then just turn the motor with a wrench on the crank bolt. It'll rotate pretty easy even if you have the plugs in. It's 2 degrees ATDC, not before. They keep changing it. Make sure it's still 2 ATDC for 2012. It was for 2011. It's in your owners manual as well as the service manuals. First warm your motor up and keep it running. Jump those two wires coming from the distributor with a 6 inch wire with bullet leads. It's easy to make one but mercury sells one. Then disconect the two wires on the top of the valve cover that run from your shift interrupt switch to your wire harness in the back of the motor. There are clear plastic covers where the wires are joined. You will then have four ends, two female and two male. Connect the two ends coming from the wire harness in the back, not the two ends coming from the switch. You should already have the timing light hooked up. You will immediately notice the engine running roughly. That's a good thing. It means you are probably close. It doesn't like running at 2 ATDC. Shine your timing light at the timing marks and hope you are at 2 ATDC. If not you will have to rotate your distributor. Make sure you can read the timing marks on the engine before you start. Mine were painted over completely and I couldn't see a thing. I had to scrub the paint off. Mark the number you want with some paint. Once you get 2 ATDC, remove the jumper and reconnect the wires on top of the valve cover. Then check your total advance. The timing changes as you give it gas. At idle it should be between 15 and 17 BTDC. And the curve goes up to 25 to 27 BTDC at 2800 rpm. These timing checks are done with everything hooked up normally. Again, the 2012 may be different and the location of your wires going to your shift interrupt switch may have changed. If you snap the crank bolt you will be in a world of hurt believe me when i tell you that. Want to turn the engine a little jump the starter with the key in the off position. If you have not done anything to change the timing, i suggest you leave it as is. Put some stuff in your gas fog as you described...drain the water out of the block....eat drink and be merry. If you snap your crank bolt by using it to turn the engine then you already have a world of problems. How in the world do you set engines to TDC by using the starter? Me i have my buddy touch the key till i achieve it. Hey i have a idea i did this once, we pulled all the plugs out and my friend turned the prop after i placed the throttle in gear. Maybe turning the belts ? Just sayin and i'll say it again " Snap the crank bolt and your in a world of hurt "
Yup, but if it snaps because you used it to rotate the engine then it is already screwed up and needs to be fixed. Either because it is corroded or some genius decided to draw the balancer/pulley on with it. You guys confirmed my suspisions. Thank you. The timing I just wanna be able to check and confirm my understanding of operation, more than likely it is timed properly from factory (My faith in the manufacturer is shakey at best though) and with only about 20 hours, I need not be too concerned about it. It sounds like David knows the ignition timing procedure. Look at your 2012 specs like he suggests. Lastly, I ask because I'm winterizing and spraying some storage fogger oil into the cyl's through the spark plug holes, after I spray I wanna crank the engine a few revolutions to spread the oil around with the plugs out. Of coarse the ign coil will be damaged if I don't have the plugs or plug wires grounded while cranking. If I turn the dead man switch/kill switch to off and crank the engine in neutrel I will not have spark and effectivly deactivate the ign and coil, there by saving my coil from damage, correct? With your engine @ 1,200 rpm or so, you'll begin to spray the fogging solution into each throttle bore as a helper kills the ignition and without touching the throttle position. You'll continue fogging until the rotating assembly comes to rest. With this method, the fogging oil is not burned during combustion for the last few revolutions. Once done, DO NOT rotate the engine again until you recommission in the spring time. If you do this, I'd completely disable the power to the ignition. The kill lanyard switch would seem like a good means. Sorry to pile on top of an already large heap here..... but this is an important one. If you snap your crank bolt by using it to turn the engine then you already have a world of problems. The crankshaft center bolt has a certain torque torque limit and is set to a certain torque value. If you were to exceed it's value, you may break the bolt. And this is easier than what most think.... spark plugs out or not. If you must do this, use a torque wrench, and DO NOT exceed the bolt's torque value..... or, you turn the engine over in the opposite direction of the bolt threads. Worst case..... the bolt loosens. Better yet.... use a strap wrench. As for turning over the engine, I'm of the work smart not hard pursuation. The crank bolt is the obvious choice, easy enough, especially with the plugs out. Try telling this to the guy who just pulled his engine out, and is now at the local machine shop to have a bolt fragment removed from his crankshaft! 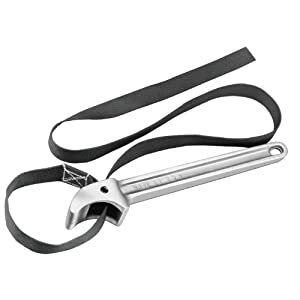 Here are several simple strap wrench solutions that are a safe bet. If you yourself use the crankshaft bolt to turn an over with (or you leave your thermostat out, for example), these are suggestions that may be better if kept to ourselves. IOW, do it yourself if you want to........., but keep it from the forum. An unsuspecting onlooker may take it at face value and follow suit.